Hi guys! Happy last day in November! Can you even believe it? I cannot, but I am the biggest lover of all things holiday, so I am so happy! I have been blasting Christmas music nonstop, burning holiday scented candles (this cheap-o Glade one is my fave and literally smells up your whole house) and drinking mini hot chocolates from Starbucks on the daily. I just adore this time of year! Today is all about my current love for maxi dresses and cozy vests. The weather here has officially gone cooler on us and I am loving this easy layering. This Jetset Diaries dress (also available here) caught my eye and I knew it would be such a fun piece to style in warm temps as well as cooler ones. I love the mix of colors and the sassy fit (can’t beat a good leg slit!) I paired it with this super super cozy faux fur vest from Show Me Your Mumu. I have been living in this thing! I love that it’s sweater material! The neutral tones of the faux fur make it super wearable. To spice up the look, I added on my Gucci belt (which I am sure you guys are sick of seeing, but honestly it’s the best way to give a look some personality!) and I borrowed my sister’s teal blue nano Celine. I am so lucky she lives in LA and that we can share bags! She got this one when I got my bright red one earlier this year. It’s so great to switch and borrow each others, it’s like getting a new bag! I hope you all have a fab day today! I feel like I am finally a bit recovered from all the drinking and nonstop fun of last week! If you follow me on instagram, you probably saw that I fully enjoyed everything about our Palm Desert getaway. I know I have mentioned it on here before, but if you need a perfect hotel there, the Ritz Carlton is so so fab! 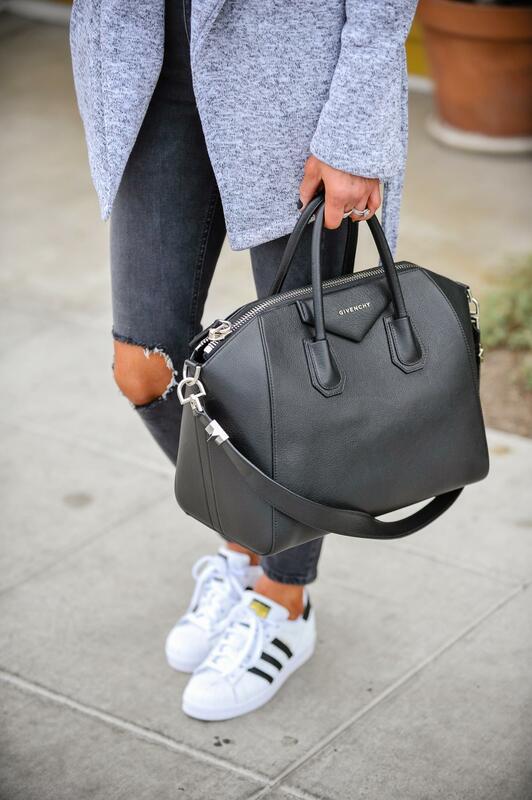 Cozy, comfy and luxe! I am off to a fun holiday pop up shop event tonight with some other bloggers that I am so looking forward to! Nothing better than all the fab soirees of the season, right? Happy shopping! Hi guys!! Happy Cyber Monday! There are so so many fab sales going on right now, right? I find it all a bit overwhelming, so instead of sharing just cyber monday deals, I decided to share some of my favorite sale finds. Most of these are half off their original prices and are all items you could wear now! If you hover over the item it will bring it the retailer and price. HAPPY (black) FRIDAY!! One of my most favorite days of the year! I hope you are all out there attacking all the best deals and enjoying your holiday weekend. Our Thanksgiving was so yummy and relaxing and today we are off to Palm Desert for the weekend. I will be insta-storying nonstop, so be sure to follow along! Today I am getting alllll sporty spice in this comfy fleece wrap jacket from BB Dakota (also available here and similar option here). This super affordable throw on is the epitome of comfort! I love the light grey color and that it comes with a belt! My dream! I paired it with this simple white lace cami (same brand, different style here) from Cami NYC as I wanted to keep it a little bit feminine atleast! When I was creating this look, I was so thinking Thanksgiving day casualness or black Friday fun, so I went with these high waisted jeans from Topshop to keep it super easy and simple. I love the color of these and you can’t beat the $75 price tag! They come distressed, but I actually cut out the knees completely as I am all about that look right now (always about a little personalization/DIY! when it comes to fashion). For sunnies, I wanted to pull from the grey of my jacket and the silver tones of my Givenchy, so I went with these from Illesteva. I hope you all have the best, best weekend! I am so excited to play in the desert at one of our most fave hotels. They have a candy bar in the lobby…I mean, how fab?! Happy shopping, loves! ps- Be sure to check out my new Holiday Gift Guide tab on the menu bar! I picked out a ton of gifts for her/gifts for him in a variety of prices! I LOVE shopping for others, so if you ever need more ideas, please email me! HAPPY FRIDAY, FRIENDS! We made it through this tre hectic week! I have been nonstop and will continue to be nonstop until we leave for our trip to Mexico. I haven’t actually packed a thing yet, which is so unlike me as I normally pack atleast a week in advance for a trip. I usually map out all my outfits and get them all set to go, but since I am shooting a ton of looks today I have been super consumed with that. Trying to come up with Wintery outfits when it’s still 90 degrees out as been interesting! Onto this super fab denim skirt from GRLFRND. I love the broken in look and the fact that it’s so high waisted (I clearly have an obsession). This skirt is so fun with just a simple tee or oversized cozy sweater and some flat otk boots too. To keep with the flirty and fun feel, I went with these fun booties from Michael Kors that I found at Saks while we were in Vegas (sadly they are sold out in black, here and here are similar options). I love how they hit right at your ankle- definitely a leg lengthener! Since I was thinking date night when I was putting this look together, I went this super plush wine colored velvet clutch from Rebecca Minkoff (also available here). How super dreamy??! I plan on using this fabness all holiday season long! I adore that its so on trend, but not too spendy ($95). It would be a fun gift for your bestie or sister too! I finished off this look with my go-to Karen Walkers because the black + gold matched perfectly! Everyone always asks about my criss cross ring…it’s 100% not real and 100% this one from BP ($12!!) Of course I want the real version by EF Jewels, but I am pretty happy with this one for now! And my nail color is OPI “Lincoln Park After Dark” a total oldie but goodie that I wear nonstop!